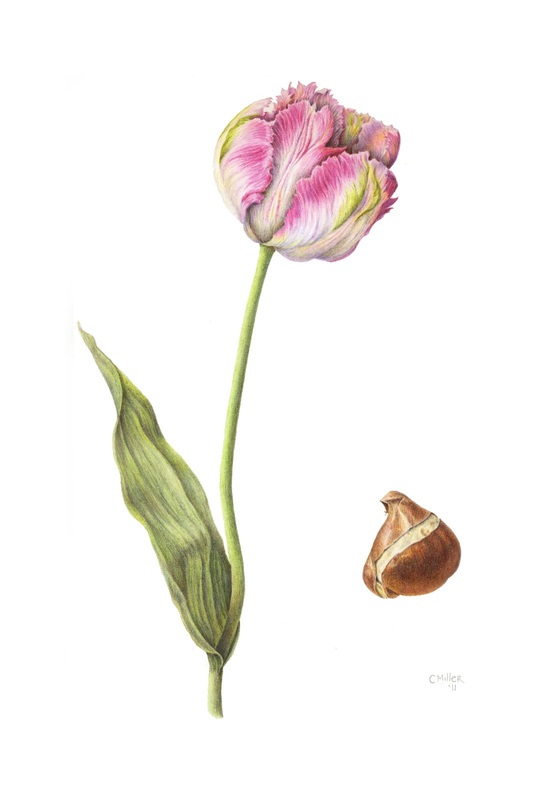 Cheryl Miller ~ Botanical Art: Tulipa - "Apricot Parrot"
Part of the enjoyment I receive from botanical art is getting to know the flowers and plants from my garden on a different, more intimate level. I have always loved the frilly, multicolored shades of the Parrot tulip. This bulb was most interesting with the "sash" curving around the middle as the skin of the bulb cracked wanting to grow. So before it went into the ground, I made a drawing. Since this was a Mixture I waited spring for the right colored flower. This one was my favorite. Hope you enjoy this bit of my garden.